Little, Brown Books for Young Readers, 9780316083393, 32pp. 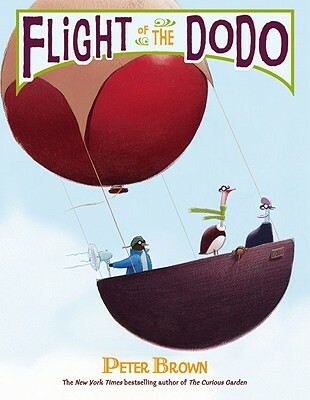 From New York Times bestselling author Peter Brown, Flight of the Dodo is a humorous and universal story about the desire to fly, persistence, the love of adventure, and most important of all....poop! Not all birds can fly--a fact Penguin knows all too well. When Penguin gets pooped on by a goose flying overhead, he becomes more determined than ever to fly himself! He gathers up his three flightless friends (they call themselves the Waddlers), and sets about building a flying machine. Readers will know Peter Brown's quirky characters from bestselling books like Children Make Terrible Pets and Mr. Tiger Goes Wild. Kids and adults alike will love the Waddlers' hilarious adventures! Peter Brown is the author and illustrator of many bestselling children's books, including Children Make Terrible Pets and The Curious Garden. He is the recipient of a Caldecott Honor for Creepy Carrots!, two E.B. White Read Aloud Awards, a New York Times Best Illustrated Children's Book award, and a Children's Choice Award for Illustrator of the Year. Peter's website is www.peterbrownstudio.com.